President Monaco, distinguished guests, graduates, families and friends, let me begin by recognizing those celebrating their reunions. Thank you for your support of the university. I want to especially point out those celebrating their 50th reunion. They may have more in common with you graduates today than you realize. They graduated during a very polarized time. 1968 was a year of conflict and change; marches in D.C.; protests around the country; and in ways, you faced very similar challenges to those that await them. For me, 40 years ago, sitting where you are, things were a bit calmer in the world. Even so, my graduation day was a day of mixed emotions. On hand, I was happy. I had my degree in mechanical engineering; I had a job; I had an apartment. On the other hand, I was terrified. I had no idea where it would lead. We all have expectations when we graduate, based on our understanding of the world around us and our view of what's to come. You know, back in 1978, we'd recently been introduced to Star Wars, and who knew that it would become the cultural phenomena it is today. Back in 1978, Jerry Brown was governor of California, and who would have thought he'd be governor of California in 2018. Some things, very hard to predict. Back in 1978, the first global positioning satellite was launched, and the first cellular mobile phone system was introduced. The phones were like bricks and very few people had them, but we were on our way. Many think such advances came quickly, but they were decades in the making. Like personal computing and the world wide web, to enable things, these had to come together synergistically for it to occur. Futurists may have seen something like the smartphone, but few foresaw the human impact. I doubt anyone anticipated social media as we know it today, or things like texting while driving would be an issue. Predicting human impact is a challenge that comes with every technology. Forty years from now, you'll be looking back on technologies like robotics, how has it evolved, how has it changed societies and economies? Currently, there's a lot of talk about the end of work. I'll make my own prediction: robotics isn't about the end of human work. We're too focused on being more creative. We can create work for the future. We have to think not about what robots can replace that we do today, we have to engage in the very hard work of thinking beyond the obvious, and how we can add value to them. We'll find our way, more ways to stay creative, stay engaged, to create value. Human nature is not going to change, and human beings are not going to go away. Well, at least I hope not. So, what does that mean for each of you? Regardless of the field you're in, you will have to deal with basic human issues in the decades ahead. Our ability to tackle human problems will increase, and that's where the opportunity will lie. So, how do you prepare for such a future? Well, you undergraduates all have a good start, you have a degree from Tufts, and you graduate students, a great next step. I'd like to share with you, though, three career constants for me in the last 40 years. So, what are they? Well, first and most obvious is skills and creativity. No matter what degree you have today, you have to keep in mind that as a career entrée, it has a half-life. For some of you in highly technical fields, that half-life could be measured in a few years at best. So, it'll be up to you to keep sharpening your skills, to retire skills no longer needed or marketable, and to replace them with new ones. Whole industries will come and go during your careers, so you'll have to be alert and adaptable. Skills development and your learning are never finished. The interesting part is the one set of skills I had to learn after I graduated from here, was surprisingly, collaboration. It's the norm now, but in the 1970s, we were taught to be great individual contributors to advance our own capabilities. But the world evolved. Early on, I found myself part of small teams completing a project. Later, it was building larger teams to start new businesses. But for me, the most memorable, was the opportunity I had at DuPont, to create a safety business from scratch. The company had a legendary safety heritage, many people on the team I formed were seasoned professionals who understood industrial safety inside and out. Neither they, nor I, have ever tried to market it to a third party, but we made it work. We brought together a very diverse set of people to tackle the issues, to learn from failure, to do things even we didn't think we could do, and we solved some pretty tough problems, and we ultimately built a very innovative and successful business. And that leads me to my second career constant: resolve to develop yourself as a problem solver, how to break down an issue, how to create a sustainable solution. Early in my career, I learned to recognize the difference between a person who came to work just to do a job, and the person that came to work to solve problems. The problem solvers were destined for great opportunities. Just as my engineering degree taught me to be a problem solver, my graduate degree in management taught me how to apply those skills more broadly to very different issues and opportunities. I didn't think of myself as a leader or a strategist, but 40 years later, that's exactly what I've done. 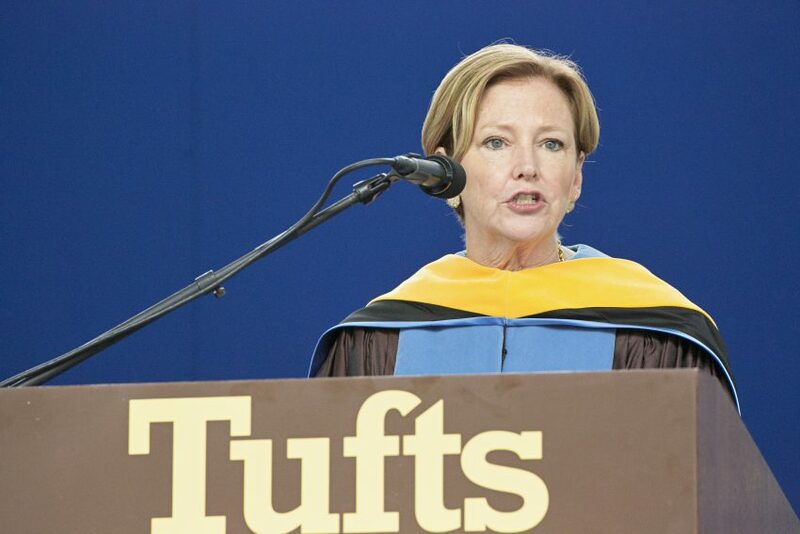 Along the way, I had to realize that what I learned at Tufts, the fundamentals, formed the foundation I had to build on. I had to recognize that I needed to change to be relevant in a changing world, and one way to do that was to be a collaborative problem solver. And because problem solvers usually have more questions than answers, I had to learn to take a look at things from different angles, to shift my perspective, to assume different points of view, and that didn't come natural to me. It's something I had to spend quite a bit of time in my career and understand that even though that logical engineering background, I'm not always right. I had to listen more than I spoke, and I had to continue to learn. Eventually, I was offered the job as CEO at DuPont. The opportunity came at an inauspicious time. My new job was announced on what is known as Lehman Weekend, the start of the global financial crisis, September of 2008. In the weeks following, markets collapsed globally, revenues dropped 50 percent in our industrial businesses, and I very quickly got to see who in the organization were real leaders, real problem solvers, and who were the ones that struggled in the midst of uncertainty and ambiguity. As a team, we talked about one thing: that we could be sure that post-economic crisis, the world would be a different place, and we would have to be ready for what was coming next, even if no one was quite sure what it was. Our first and most important step was not some dramatic business decision, rather it was determining what our constants were, what would not change, what we needed to focus on. In this uncertainty, what could we control? And at the top of our list was a recommitment to our core values, which brings me to our third, my third, and I think my most important career constant. Determine what your personal values are and resolve to yourself that they're non-negotiable. Most organizations you become part of, they have a set of core values. In fact, if they don't, run, don't walk, in the opposite direction. And don't mistake mission for values. Mission is what an organization does, values are the way it does it. But as critical as institutional values are, even more important will be your personal inventory of values. What are the principles you hold dear, what do you stand for? Early on, I picked three: integrity, fairness, and putting my family first. These were the values I would live or work by. Integrity meant no ethical compromises, regardless of the business, the customer, the market, or region of the world. Fairness led to my lifelong commitment to making sure everyone, and in particular, women, have the opportunities to succeed, and putting my family first, well, it often meant I left the office early to see my kid's lacrosse or basketball games, and if I had to work after they went to bed so I could catch up, so be it. I can't overstate the importance of personal values. It's likely you will work for many different organizations in your years ahead. Your personal values will be your primary ethical and moral compass. Know how to read that compass and trust what it tells you. The constants I've lived by and shared with you today helped me, and I hope they'll help you. Keep your skills sharp, become a problem solver, never compromise your values. The increasingly polarized world we're living in needs both you and these skills more than ever. And I'd like to close on that note. Something every one of you can do immediately, regardless of your next step in life, is to look for ways not to give in to the polarization that has come to characterize so much of our public discourse. Dare to commit to civility, demonstrate that we can disagree without being disagreeable. I've personally been involved in enough high-level negotiations over the course of my career to know that the complex human issues you'll be dealing with in the years ahead will be poorly served by approaching every issue as a zero sum game. You may be pressured to see things otherwise, to see every confrontation as a proverbial hill to die on, to see every opponent as an enemy, but not a competitor. Resist those pressures as best you can, and in the long run, you'll be happier, and I believe, successful in doing so. So, I congratulate you on your achievements, I applaud your parents, your family, your friends for the support they've given you, I wish you every success in the future, and I sincerely hope there is one among you that gets to come back here 40 years from now and tell another graduating class how it all turned out. Thank you.